Ease of access to the world-class research and development facilities on offer at the Advanced Manufacturing Research Centre’s (AMRC) Factory 2050, is being made even easier for small or medium-sized enterprises (SME). The AMRC Integrated Manufacturing Group (IMG) based at Factory 2050, is unveiling a new opportunity for smaller companies to more easily conduct research into machining and assembly technologies on a new ‘reconfigurable factory’ research cell; in a safe and cost-effective environment. 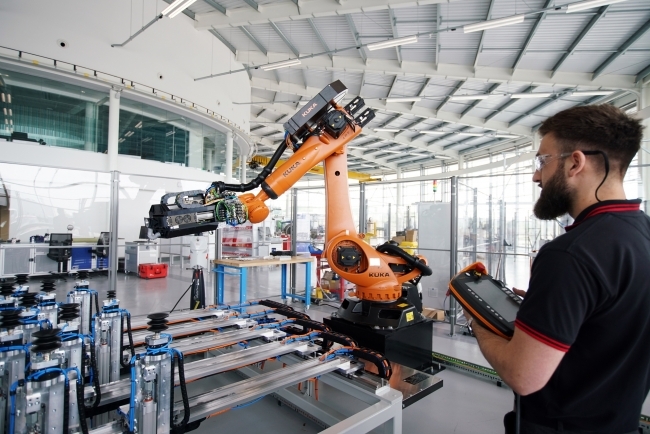 Factory 2050 is the AMRC’s latest development, built for IMG to conduct collaborative research with industrial and academic partners into reconfigurable robotic, digitally assisted assembly and part inspection technologies. The facility is capable of rapidly switching production between different high-value components and one-off parts. With the introduction of a reconfigurable factory demonstrator, SMEs will have access to a generic research and development cell, where they can work with IMG engineers on manufacturing projects designed to take the risk out of trialling new technologies and processes before putting them into production. Operations Manager for IMG, Chris Greaves, said the cell will be able to accommodate projects spanning the trialling of new robotic assembly techniques for mass customisation or even small batch manufacturing techniques, small component assembly, and finish machining and polishing operations. The new cell is the result of a previous project conducted by IMG to produce a small scale, totally reconfigurable factory floor demonstrator. That project is now being scaled-up for industrial use into a full-scale production cell with multiple tools, grippers and sensors. Greaves said: “The cell will be able to be reconfigured to the specific requirements of an SME with a shorter lead time. This will allow easier, quicker and more affordable engagement for SMEs. As a member of the High Value Manufacturing Catapult, the AMRC is open to work with any business, big or small. 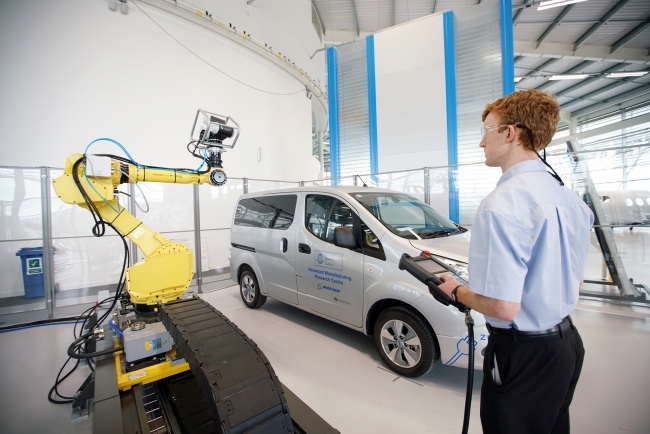 IMG want small businesses to think of the AMRC as a sandpit, where they can prove-out automation or robotics, or new manufacturing processes at low-cost and with low-risk. “Projects don’t have to be long running or expensive to make big changes in short amounts of time,” added Greaves. “Even small projects requiring a short-lead time can be cost-effective and contribute to the improving productivity of a company. IMG want to challenge the perception that robotics, automation and the introduction of digital manufacturing technologies aligned with the “4th industrial revolution” are just for big businesses with deep pockets. Head of IMG, Ben Morgan, said: “There is a common misconception that automation and robotics cause unemployment. What we are seeing in the market is that companies who are implementing automation are re-distributing jobs within their business and as productivity increases, so do profits and re-investment. More competitive manufacturing will mean more orders and ultimately more jobs for the region. It is imperative that the Sheffield City Region embraces automation in order that work is not lost to lower cost economies. The new research cell will be up and running towards the end of autumn in 2017 and IMG are encouraging any smaller manufacturing business who is interested working with them, to get in contact.